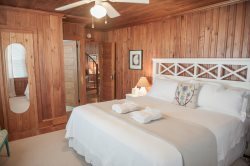 Named after the Roanoke Sound that lies between the Outer Banks and Roanoke Island, The Roanoke is a spacious interior room nestled between The Albemarle and The Pamlico rooms on the southern side of the house. The Roanoke enjoys early morning and afternoon sun. Queen Bed, Private Bathroom, Central A/C, Cable Flat Screen TV, Wireless Internet, Ceiling Fan, Microfridge, Hair Dryer, Iron Available.